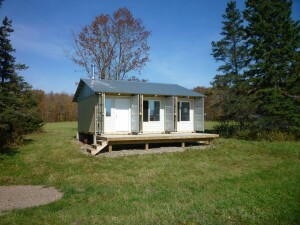 The siding is finally up, and my cabin now looks less like a tar paper shack when the doors are open. The siding has been one of those easy things to postpone since it didn’t improve my comfort when I was there, and the container doors completely protected the walls when I wasn’t. This is one of those bigger bang for the buck improvements since it was relatively cheap and only took a day to complete. 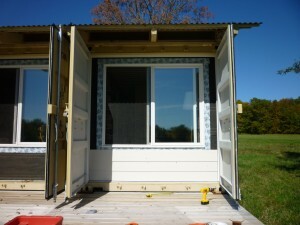 BTW, the pictures here show the siding with just the pre-primed finish. I plan to paint the siding a tan that matches the containers in the next couple of weeks. The siding I used was LP SmartSide Precision Lap. The Precision Series of SmartSide is a treated strand (OSB style) of engineered wood siding, and seems to have an excellent reputation among those who have used it. I would personally stay away from LPs SmartSide Foundations lap as it’s a lower quality fiber substrate. SmartSide is easy to cut (unlike fiber-cement siding), comes pre-primed, and has an attractive wood grain finish. I was also able to use my Paslode framing nailer to install it, which saved a lot of time. SmartSide is reasonably priced at about $8.50 for a 3/8″x8″x16′ board. 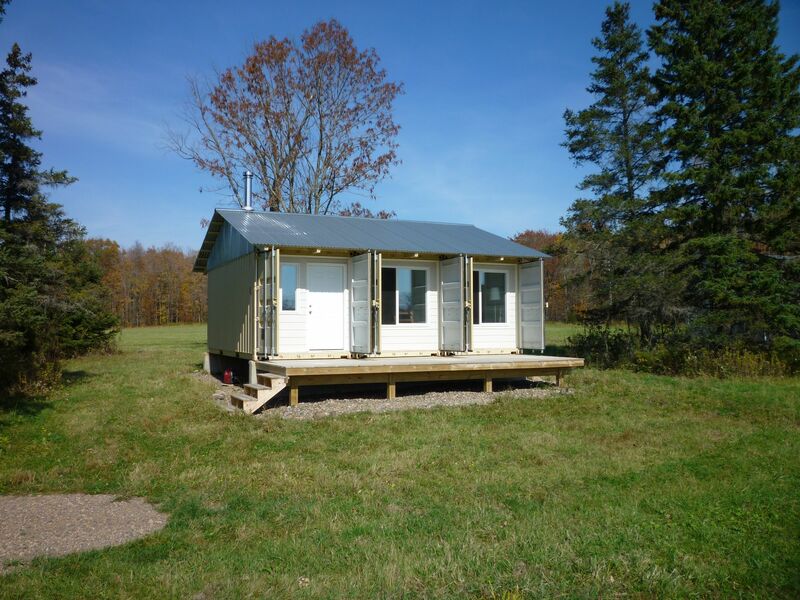 It only took ten of these boards to side all three openings of the cabin. I also went through about five tubes of OSI Quad caulk, although some of my side gaps were probably on the large side. One thing I did splurge on was about $150 worth of Azek PVC trim boards to act as the interface between the metal containers and the wood frame wall. I wanted something that would never shrink or warp to to tie these two parts together and keep the bugs out – the Asian lady beetles around here can squeeze through almost anything. Some of the pictures on my Exterior Walls post show these unavoidable gaps between the container and framing. There is one thing I am concerned about with this siding, and also the wall behind it. 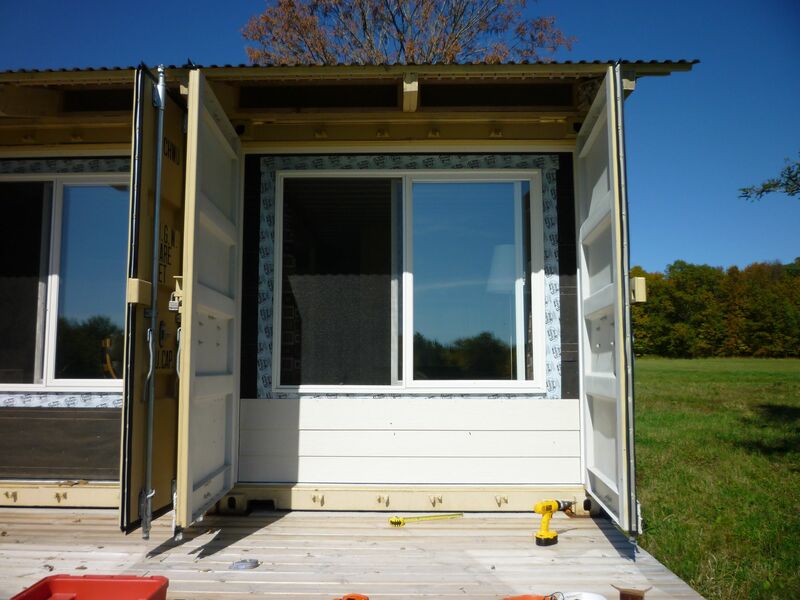 While one would think that the container doors would adequately protect the siding, there is no ventilation when the doors are closed tight. Heat could build to higher than normal levels, and humidity could get trapped behind the closed doors in that small space. As a temporary measure I have been leaving the windows in to the cabin open a small amount to dissipate any excessive heat or moisture, since the cabin itself does have a minimal amount of natural ventilation. My long term plan is to add some ventilation ports to the the doors so they can vent on their own. On a non-construction related note, here’s a pic of my north field. The colors must have peaked a few days before this as last weekend the trees were mostly green. Fall has always been my favorite time of year, and I only wish it lasted longer. 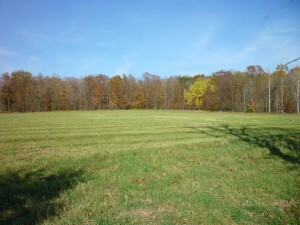 This entry was posted in Construction on October 10, 2011 by Steve. Gorgeous North field! Our front field currently is being enjoyed by goats. We also have a little battle with crevices.. ants. Black ants. They’re everywhere and very challenging to keep at bay. Best wishes.. saw your link through Tiny House Design. Look forward to reading updates. One of the best things about my container cabin is the total lack of mice or insects inside. My previous hunting shack was always infested (1,000+) with cluster flies this time of year and it was disgusting. The “attic” of my container cabin has a bunch of them this year, but not a single one has made it into the living area of the cabin. I’m sure the roofs framing members have shrunk and warped to create some cracks where they can get in. I will need to get up there next year to caulk and foam the cracks.